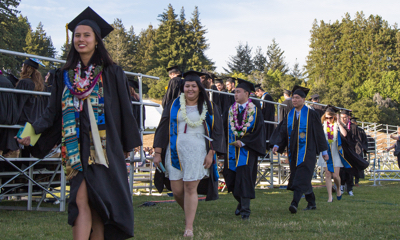 UC Santa Cruz commencement ceremonies are scheduled for Friday, Saturday, and Sunday, June 16–18, hosted by the campus's 10 colleges, graduate division, and Baskin School of Engineering. A complete list of commencement events including times, locations, and speakers can be found online. Other celebrations organized by individual departments and resource centers will be held in the week ahead. Approximately 3,000 students have applied to participate in college commencement ceremonies. More than 4,800 UCSC students are earning undergraduate and graduate degrees for work completed during the 2016–2017 academic year. A total of 4,170 students are candidates for bachelor degrees for work completed in the arts, engineering, humanities, physical and biological sciences, and social sciences. Spring candidates for bachelor degrees total 2,609, according to the UC Santa Cruz registrar’s office. Another 1,561 completed coursework and applied for their degree after the summer, fall, or winter quarters. Additionally, 222 doctorates will be awarded for the 2016–2017 academic year; 140 for work completed in summer, fall, and winter quarters, and 82 to candidates who have applied for a June degree. Another 362 graduate students are eligible to receive master’s degrees; 237 have been awarded already, 125 students have applied for spring. Approximately 150 graduate students are expected to participate in commencement ceremonies, Friday, June 16. Seventy-six students are scheduled to complete UCSC’s education teaching credential and master’s degree program in late summer. The ten colleges, the graduate division, and the Baskin School of Engineering have invited an array of speakers to share advice and wisdom with soon-to-be alumni.